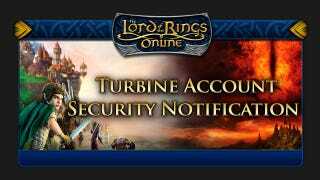 Turbine, developers of Lord of the Rings Online and Dungeons & Dragons Online, have sent out an email this evening warning users that the studio's forum accounts may have been compromised. Here's hoping the "third party" didn't "modify or compromise" any forum accounts. And if they did? Here's hoping you didn't have the same password for both the forum and your actual game account.